Soulcalibur VI has added series antagonist Inferno as a playable character. The fiery monstrosity served as a boss in first four SoulCalibur games, and was an unlockable character in SoulCalibur and SoulCalibur II. You can check out the big brute in action, below. 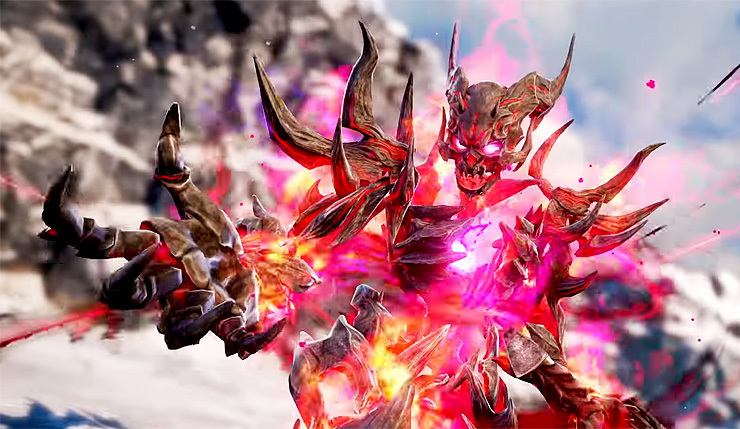 Inferno, the original antagonist that kicked-off decades of struggle for power in both Soul Blade and SoulCalibur returns to SoulCalibur VI to wreak havoc and deal death to all challengers. Inferno took the shape of a sword in order to devour more souls and came to possess individuals to further his unholy cause. In his sword form, Inferno came to be known as Soul Edge. Those who held the Soul Edge were unable to escape from the curse of his evil powers. In addition to the newly-revealed Inferno, Raphael, Cervantes, Astaroth, Seong Mi-Na, Voldo, Talim, Maxi, Yoshimitsu, Sophitia, Mitsurugi, Kilik, Nightmare, Xianghua, Ivy, Zasalamel, Siegfried, Taki, the Witcher series’ Geralt, and new characters Grøh and Azwel will be part of SoulCalibur VI’s launch roster. Returning character Tira will be released later as DLC. That’s 22 launch fighters revealed – based on character select screens seen at preview events, it’s expected SoulCalibur VI will launch with 23 characters. Soulcalibur VI hacks and slashes its way onto PC, Xbox One, and PS4 on October 19. Wccftech’s own Christian Vaz recently had a chance to go hands on with SoulCalibur VI – check out his impressions here.